141 records – page 1 of 3. This portion of the recording pertains to Georgina Nicholson's parents' early years of marriage as well as her own childhood in Burnaby. Georgina discusses recreational activities that she took part in as a young person as well as the culture at school. Recording is an interview with Georgina Nicholson conducted by Burnaby Village Museum employee Eric Damer, November 2, 2012. Major theme discussed: the life of a teenager in the nineteen-sixties. Georgina Nicholson's parents were married in 1929 and moved into their house in North Burnaby. Georgina Nicholson was born in 1948 and grew up playing in neighbourhood parks. Georgina went to Rosser Avenue Elementary, Alpha and Burnaby Heights Junior Secondary, and North Burnaby High Schools. She later studied at the British Columbia Institute of Technology (BCIT) and pursued a career as a laboratory technologist. This portion of the recording pertains to Georgina Nicholson's teenage years. Georgina discusses her parents' involvement and her life at school, making mention of popular music and fashions. She also talks about two Burnaby Heights businesses; Helen's and Regent Theatre. This portion of the recording pertains to Georgina Nicholson's teenage years. Georgina discusses the popularity of sports, her family's first television and the renovation of the family home. She mentions Brentwood Mall first going in along with the first shops it housed. This portion of the recording pertains to Georgina Nicholson's childhood years. Georgina discusses the food she grew up on and the toys that she played with as a child, as compared to what she sees now. She briefly mentions taking tap dance classes in Vancouver. This portion of the recording pertains to Ron Smitherman's memories of his early years in construction. Ron discusses what it was like to be in construction during the postwar era. He also discusses his father's work as a carpenter and the changes that occurred with the introduction of electric carpentry tools. Ron Smitherman, [199-]. Item no. 549-065. Recording is an interview with Ron Smitherman conducted by Burnaby Village Museum employee Eric Damer, November 15, 2012. Major theme discussed: building construction and development in Burnaby. Born in 1933 and raised in Vancouver, Ron Smitherman learned the construction trade from his father, upgrading his knowledge and skills as techniques and materials changed and improved. Ron built houses and commercial buildings in Burnaby and elsewhere during the nineteen-forties, fifties and sixties. In 1969 Ron and his family settled in Burnaby where he shifted his business to real estate. This portion of the recording pertains to Ron Smitherman's memories of changes to house construction over the years. Ron discusses working in construction, designing his own house and changes to the process of obtaining building permits (including a situation involving direct wiring in his home). This portion of the recording pertains to Ron Smitherman's memories of the postwar construction boom in comparison to the modern day. Ron discusses the changes in construction practices which lead to the leaky condo phenomenon. This portion of the recording pertains to Ron Smitherman's memories of changes to construction regulations over the years. Ron discusses Burnaby's industrial construction during the postwar era and beyond. He explains environmental and municipal regulations in relation to common practices within the construction industry. This portion of the recording pertains to Ron Smitherman's memories of construction regulations and public policies that made Burnaby unique. Ron discusses the impact of paved lanes and unusual lot widths. This portion of the recording pertains to Ron Smitherman's memories of the construction of industrial areas in Burnaby. Ron discusses the progressive construction of industrial buildings and goes on to describe independent construction projects. This portion of the recording pertains to Betty (Warburton) (Atkinson) Blair's memories of her early years in Burnaby, including school days at Kingsway West School, Nelson Avenue School and Burnaby North High School. She discusses her family's circumstances and experiences through the war years. Graduating class at Burnaby South High School; Betty Warburton is third from the right in the front row, [1942 or 1943]. Item no. BV004.82.5. Recording is an interview with Betty (Warburton) (Atkinson) Blair conducted by Burnaby Village Museum employee Eric Damer, October 17, 2012. Major theme discussed: life in Burnaby during the war years. Betty Warburton (later Atkinson) (later Blair) was born in 1926 and grew up at three different locations on Frederick Avenue in Burnaby. She went to school in Burnaby; first at Kingsway West for two years, then Nelson Avenue and then Burnaby South High School where she completed senior matriculation. After graduation, Betty worked for a few years in Vancouver before marrying her first husband Don Atkinson and raising their children in Burnaby. Betty (Warburton) (Atkinson) Blair has participated in a range of activities from hiking and Girl Guides to volunteer arthritis care. By the nineteen-sixties she had began to learn pottery and take lessons at Mather House in Burnaby. This portion of the recording pertains to Betty (Warburton) (Atkinson) Blair's memories of the war years, including her involvement in fundraising activities. She discusses her high school experience, her sister's influence in her life, taking the Central Park interurban line and playing field hockey. This portion of the recording pertains to Betty (Warburton) (Atkinson) Blair's involvement in Field Hockey as a member of the Women's League. She also discusses her earlier involvement in Girl Guides. This portion of the recording pertains to Betty (Warburton) (Atkinson) Blair's memories of events held at the Church, including her own wedding. She discusses her involvement with the church group Canadian Girls in Training. She also discusses her volunteer years at the Burnaby Hospital and her life when her children were small. This portion of the recording pertains to Betty (Warburton) (Atkinson) Blair's teaching of parenting effectiveness training and the role of the Parent-Teacher Association. She discusses her love for libraries and secondhand books and how she passed that on to her own children. Betty tells a story of her early political life, and of her and her mother's respect for Ernie and Harold Winch. This portion of the recording pertains to Betty (Warburton) (Atkinson) Blair's memories of popular culture activities that she has enjoyed. Betty discusses listening to the radio, singing around the piano and going out to the theatre as a girl. She also mentions her more recent pottery practice. This portion of the recording pertains to Edward Lewis "Ted" Burnham's early memories of growing up in Burnaby. He talks of his brothers going into the service and of his own work history which includes working for the municipality of Burnaby. Edward Lewis "Ted" Burnham, [195-]. Item no. 549-021. Recording is an interview with Edward Lewis "Ted" Burnham conducted by Burnaby Village Museum employee Eric Damer, September 19, 2012. Major theme discussed: the role of the municipal worker in the nineteen-fifties and nineteen-sixties. 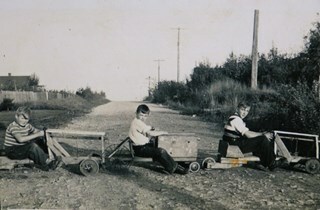 E.L. "Ted" Burnham was born in 1930 and grew up in East Burnaby. He attended Armstrong Street and Edmonds Schools and then Trapp Technical High School before beginning work at a range of occupations in the late nineteen-forties. Ted studied business administration at the University of British Columbia and worked from 1953 to about 1958 for the municipality of Burnaby in the engineering and welfare departments, then briefly for Remington-Rand computers, and then at the Hannah Medical Clinic until 1973. After marrying in 1957, Ted and his wife moved from McKay Avenue to Kaymar Drive and raised two daughters. 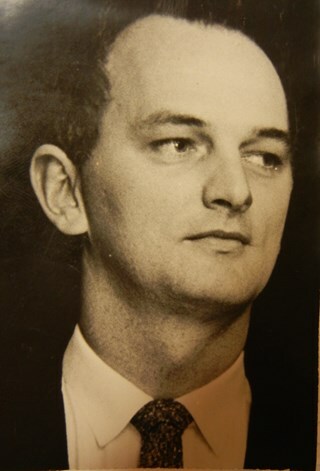 In the ninteen-seventies and later, Ted became involved in municipal politics, the Heritage Village, and in his own real estate and insurance business. This portion of the recording pertains to Edward Lewis "Ted" Burnham's memories of the interurban tram. He mentions getting his driver's license and goes on to discuss more of his work history; in the computer industry, then in the medical industry. This portion of the recording pertains to Edward Lewis "Ted" Burnham's personal life. He discusses activities undertaken by his daughters and his wife while living in Burnaby. He also discusses the changes that have happened in Burnaby, including during his time on the assessment appeal board. He mentions controversy surrounding Oakalla land development in the nineteen-fifties and nineteen-sixties. This portion of the recording pertains to Eleanor (Toebeart) Dricos' memories of her early years in Burnaby, from the age of nine, when her interest in music first began. Recording is an interview with Eleanor (Toebeart) Dricos conducted by Burnaby Village Museum employee Eric Damer, October 15, 2012. Major themes discussed are: music students and music teachers. Born in Vancouver in 1947 Eleanor Toebaert (later Dricos) and her parents came to the new Parkcrest neighbourhood of Burnaby nine years later. While at Sperling Elementary, Eleanor took group piano lessons with June Perry and began her career studying, playing, and teaching piano. Eleanor finished her schooling at Kensington Junior High and North Burnaby High Schools. During the mid-nineteen-sixties Eleanor often attended concerts at North Burnaby community halls to listen to her fiance’s band play. After getting married, Eleanor (Toebaert) Dricos and her husband settled in Port Coquitlam where she continues to teach private piano lessons. This portion of the recording pertains to Eleanor (Toebeart) Dricos' memories of getting her music degree and how it influenced her own teaching style. She discusses the music she played on days off as well as competitions, recitals, and exams as well as concerts in the neighbourhood. This portion of the recording pertains to Eleanor (Toebeart) Dricos' memories of the concert scene in Vancouver and of listening to music on the radio and television as a child. She tells the story of getting married in her parent's backyard. Eleanor also explains why she moved to Port Coquitlam for teaching. This portion of the recording pertains to Tony Fabian's memories of first coming to Burnaby and establishing a vegetable garden. He talks about his interest in conservation from an early age. 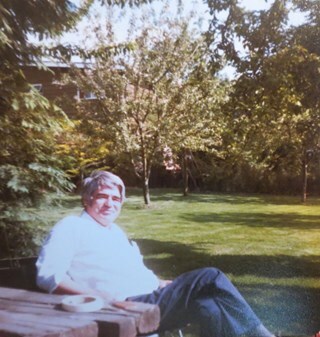 Tony Fabian relaxing at a picnic table, . Item no. 549-026. Recording is an interview with Tony Fabian conducted by Burnaby Village Museum employee Eric Damer, October 10, 2012. Major theme discussed: environmental conservation practices in Burnaby. Tony Fabian was born and raised in rural Saskatchewan in 1934. He and his wife moved to Burnaby in 1957, where he worked for the telephone company and raised a family. 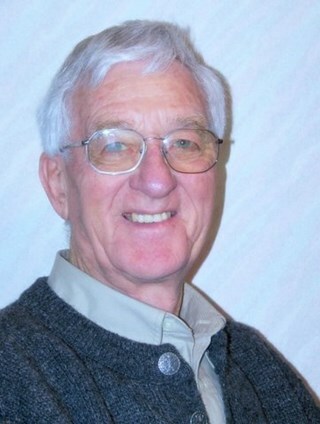 Tony has been an advocate for preservation of parklands and watercourses, helping to protect Burnaby and Deer Lake Parks and to create the Burnaby Fraser Foreshore and Barnet Marine Parks in the early nineteen-seventies, serving as a member of Burnaby’s Parks and Recreation Commission. Tony Fabian was presented with the 2008 City of Burnaby Environment Award for Community Stewardship. This portion of the recording pertains to Tony Fabian's memories of conservation practices in Burnaby, focusing on the lakes and ravines, including Burnaby Lake. This portion of the recording pertains to Tony Fabian's understanding of how neighbourhood parks came about during the Depression. He also discusses the development of the Burnaby Mountain Conservation Area. This portion of the recording pertains to Tony Fabian's involvement in the development of the Stream Preservation Bylaw in Burnaby. He discusses fish populations, air quality, and bird populations in Burnaby as well. This portion of the recording pertains to Tony Fabian's memories of the development of the Fraser River Foreshore and the Confederation Community Centre (previously named Confederation House). This portion of the recording pertains to Les Francis's early years. He begins by mentioning his school days and moves into a detailed account of working with the municipality of Burnaby in the Hall and in the Stores. 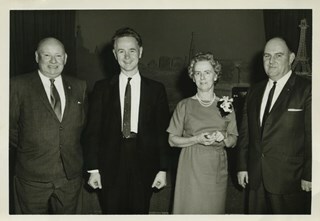 Les Francis (far right) receiving a Burnaby Long Service Award at the Gai Paree Supper Club, 1964. Item no. 485-070. Recording is an interview with Les Francis conducted by Burnaby Village Museum employee Eric Damer, October 16, 2012. Major theme discussed: the role of the municipal worker in the nineteen-thirties through the war years. Les Francis was born in London, England, in 1914 and came with his family to Burnaby in 1919. Except for a few years away on special projects, Les has lived in Burnaby ever since. After attending Kingsway West Elementary and Burnaby South High Schools, Les joined the municipal work force. He first worked as a clerk in 1930 and later joined the Engineering Department where he spent his career maintaining and extending the municipal water system. Les Francis retired in 1979 as the City of Burnaby's Work's Superintendent. This portion of the recording pertains to Les Francis's years of working with the municipality of Burnaby, with a focus on waterworks. This portion of the recording pertains to Les Francis's years of working with the municipality of Burnaby, with a focus on waterworks. Les describes the influence of industry and population on the water system as well as the history of the Greater Vancouver Regional District (GVRD) Water Board. This portion of the recording pertains to Les Francis's years of working with the municipality of Burnaby in the waterworks department and the changes he has noticed for present day workers. This portion of the recording pertains to Judith "Judy" (Robins) Hagen's grandfather Sam Robins who also lived in the family home. Judy mentions a number of her neighbours, discusses her aunt and uncles, and tells a short story involving Kingsway West School. Judith "Judy" Robins (later Hagen) posing in a dance costume, 1949. Item no. 549-036. Recording is an interview with Judith "Judy" (Robins) Hagen conducted by Burnaby Village Museum employee Eric Damer, November 7, 2012. Major theme discussed: the neighbourhood of Dover Street. Judy Robins (later Hagen) was born in 1941 and grew up in South Burnaby. Her paternal grandfather, a master stone mason from Devon, moved to Vancouver in 1912 to find work before bringing over the rest of the family. He bought three lots in Burnaby and in 1918 moved his family to a small house on Dover Street (formerly Paul Street). Judy’s father, Jack, married, bought one of his father’s lots and built a new home for his family. Judy attended school and church nearby, took dance and piano lessons and participated actively in Girl Guides. After high school, she attended the University of British Columbia (UBC) and then Simon Fraser University (SFU), worked for a few years and then married in 1967 before moving to Courtaney, British Columbia. This portion of the recording pertains to Judith "Judy" (Robins) Hagen's memories of the influx of people into the neighbourhood at the end of the war. She mentions various delivery men who sold wares along Dover Street and also mentions her uncle Fred Robins and his wife. This portion of the recording pertains to Judith "Judy" (Robins) Hagen's thoughts on local Churches and on her involvement in Church groups. This portion of the recording pertains to Judith "Judy" (Robins) Hagen's memories of religions practiced in the neighbourhood, her father's politics and what she saw as the social consciousness of her Dover Street neighbourhood. This portion of the recording pertains to Judith "Judy" (Robins) Hagen's memories of the nineteen-sixties. She tells a work-related story about her father, Jack Robins. Judy also discusses what she sees as the differences between her generation and the more recent generations. This portion of the recording pertains to George Hollinger's memories of how he came to live in Burnaby. He discusses racing at the Digney Speedway and other racetracks in the lower mainland. Recording is an interview with George Hollinger conducted by Burnaby Village Museum employee Eric Damer, November 22, 2012. Major themes discussed are: car and motorcycle racing. George Hollinger was born in 1930 in Montreal. After serving in the Navy in World War II, George bought his first motorcycle in Montreal. He spent the next seven years travelling by motorcycle throughout Canada, the United States, and the eastern part of Mexico. He built and tuned various engines that won championships in both Western Canada and the United States of America. George came to the Burnaby area for the first time in 1952 to experience Burnaby’s quarter-mile dirt track, Digney Speedway. Years later he got married and bought a house. After retiring from motorsports in 1975, George picked up hockey. This portion of the recording pertains to George Hollinger's recreational activities. He discusses the activities that he took part in during his early days in Burnaby, including shooting, hunting and going to taverns. He also mentions playing hockey which he continues to do to this day. This portion of the recording pertains to Kay (O'Cook) Jackson's memories of growing up in Burnaby. She mentions her parents' Radio Repair Shop on Kingsway and talks about different activities she would take part in with her friends. Kay also speaks fondly of Burnaby South High School and of her first years in the work force. 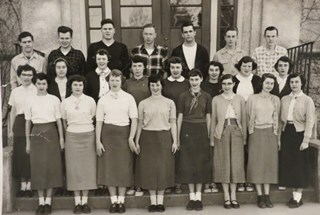 Burnaby South High School class, Kay O'Cook (later Jackson) is in the middle row, third from the right, . Item no. 549-038. Recording is an interview with Kay (O'Cook) Jackson conducted by Burnaby Village Museum employee Eric Damer, October 16, 2012. Major themes discussed are: growing up in Burnaby and volunteering at the Burnaby Hospital. Fred O'Cook operated a radio repair shop on Kingsway near McKay Avenue in Burnaby. In 1935, his daughter, Kay O'Cook (later Jackson) was born. Kay attended Kingsway West Elementary School and then Burnaby South High School. After graduating, she worked at Sears for a few years; in Vancouver and then in Burnaby when the new Sears department store opened on Kingsway. Kay (O'Cook) Jackson met her husband, Michigan-born Don Jackson through mutual friends. After their marriage, Don Jackson emigrated to Canada, and he and Kay bought a new house in Cascade Heights near Burnaby Hospital where they raised their three daughters. This portion of the recording pertains to Kay (O'Cook) Jackson's memories of her husband and growing family. She tells the story of going down to Bellingham to meet up with friends, when she met a college friend of theirs named Don Jackson (her future husband). Kay describes their home in Cascade Heights near Burnaby General Hospital and goes on to tell a number of anecdotes involving the hospital. This portion of the recording pertains mainly to Kay (O'Cook) Jackson's memories of the nineteen-fifties. She mentions Frankie Laine, Elvis and stories from her father's workroom. She also mentions her children and their current careers and tells two anecdotes; one on the changing store fonts in her neighbourhood, the other from her childhood. This portion of the recording pertains to Robert "Bob" Lowe's memories of growing up in Burnaby. He discusses the activities that he and his friends would take part in, including soapbox racing and skating. Bob mentions school teachers from his elementary school years, training to be an Army Cadet during the war years and his career after high school. This portion of the recording pertains to Robert "Bob" Lowe's memories of the development of property Burnaby. He discusses houses being built by his father, grandfather and himself; this includes the property that he and his wife bought in 1961. Bob also discusses the rise of the automobile. This portion of the recording pertains to Robert "Bob" Lowe's memories of growing up in Burnaby. He discusses transportation in Burnaby, including the first cars in his family. Bob talks about recreational activities available to Burnaby residents in the late nineteen-thirties and early nineteen-forties, as well as changes that he has seen from his time growing up to the time of raising his own children. This portion of the recording pertains to Thomas "Tom" Mark's memories of his early years. Tom briefly describes his upbringing, his years in the Royal Canadian Air Force (RCAF) and moving to Burnaby with his new wife. He discusses his work history with Shell Oil in Burnaby and tells the story of the toad situation in East Burnaby. Recording is an interview with Thomas "Tom" Mark conducted by Burnaby Village Museum employee Eric Damer, October 12, 2012. Major theme discussed: being a volunteer. Thomas "Tom" Mark was born in 1923 and grew up in New Westminster. In 1937 his family moved to Victoria, British Columbia where he finished his schooling and worked for a year in the shipyard before enlisting in the air force. He was stationed in England during the war, and in 1946 he bought a small house in East Burnaby for his English bride and himself. For three years Tom drove a heating fuel truck for Shell Oil and then became the agent for a Shell marine service station on the Fraser River, near the Patullo Bridge. His aviary garnered him the nickname “birdman of Burnaby.” His son attended St. Thomas Moore High School and then Simon Fraser University when it opened in 1965. In 1995 Tom Mark was awarded the Kushiro Cup for Outstanding Citizen of the Year for his volunteer work with the Burnaby Health Department. This portion of the recording pertains to Thomas "Tom" Mark's memories of his activities outside of work. He discusses his garden and aviary filled with birds, he and his wife's volunteerism, and his memories of how the Fraser Valley flood of 1948 affected Burnaby. This portion of the recording pertains to Thomas "Tom" Mark's memories of his neighbourhood when he first arrived up until the nineteen-sixties, as well as his working life. He also discusses his son's secondary school education. This portion of the recording pertains to Thomas "Tom" Mark's experiences as a care giver for his wife as well as a volunteer at the Burnaby Health Department. He mentions being awarded Burnaby's Kushiro Cup Citizen of the Year Award in 1995. Tom finishes his interview with a childhood story involving his uncle's roadster.